A pilot who is faced with an emergency landing in terrain that makes extensive airplane damage inevitable should keep in mind that the avoidance of crash injuries is largely a matter of: (1) keeping the vital structure (cabin area) relatively intact by using dispensable structure (i.e., wings, landing gear, fuselage bottom) to absorb the violence of the stopping process before it affects the occupants (2) avoiding forceful bodily contact with interior structure. The advantage of sacrificing dispensable structure is demonstrated daily on the highways. A head-on car impact against a tree at 20 miles per hour (mph) is less hazardous for a properly restrained driver than a similar impact against the driver’s door. Accident experience shows that the extent of crushable structure between the occupants and the principal point of impact on the airplane has a direct bearing on the severity of the transmitted crash forces and, therefore, on survivability. Avoiding forcible contact with interior structure is a matter of seat and body security. Unless the occupant decelerates at the same rate as the surrounding structure, no benefit is realized from its relative intactness. The occupant is brought to a stop violently in the form of a secondary collision. Dispensable airplane structure is not the only available energy absorbing medium in an emergency situation. Vegetation, trees, and even manmade structures may be used for this purpose. Cultivated fields with dense crops, such as mature corn and grain, are almost as effective in bringing an airplane to a stop with repairable damage as an emergency arresting device on a runway. [Figure 17-1] Brush and small trees provide considerable cushioning and braking effect without destroying the airplane. When dealing with natural and manmade obstacles with greater strength than the dispensable airplane structure, the pilot must plan the touchdown in such a manner that only nonessential structure is “used up” in the principal slowing-down process. 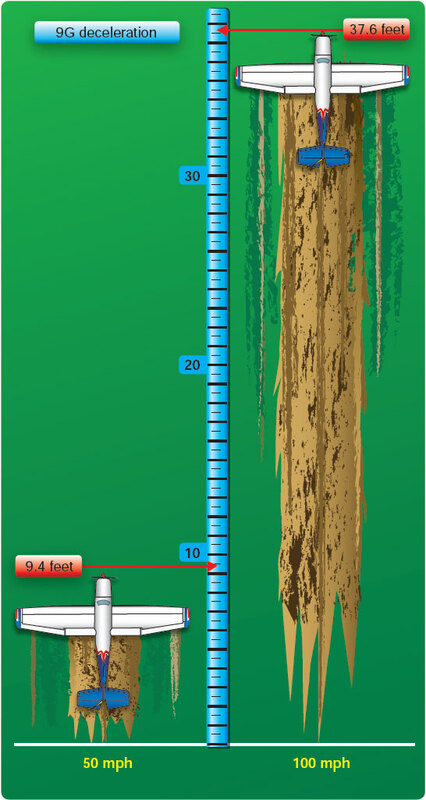 Figure 17-1. Using vegetation to absorb energy. The overall severity of a deceleration process is governed by speed (groundspeed) and stopping distance. The most critical of these is speed; doubling the groundspeed means quadrupling the total destructive energy and vice versa. Even a small change in groundspeed at touchdown—be it as a result of wind or pilot technique—affects the outcome of a controlled crash. It is important that the actual touchdown during an emergency landing be made at the lowest possible controllable airspeed, using all available aerodynamic devices. Most pilots instinctively—and correctly—look for the largest available flat and open field for an emergency landing. Actually, very little stopping distance is required if the speed can be dissipated uniformly; that is, if the deceleration forces can be spread evenly over the available distance. This concept is designed into the arresting gear of aircraft carriers that provides a nearly constant stopping force from the moment of hookup. The typical light airplane is designed to provide protection in crash landings that expose the occupants to nine times the acceleration of gravity (9G) in a forward direction. Assuming a uniform 9G deceleration, at 50 mph the required stopping distance is about 9.4 feet. While at 100 mph, the stopping distance is about 37.6 feet—about four times as great. [Figure 17-2] Although these figures are based on an ideal deceleration process, it is interesting to note what can be accomplished in an effectively used short stopping distance. Understanding the need for a firm but uniform deceleration process in very poor terrain enables the pilot to select touchdown conditions that spread the breakup of dispensable structure over a short distance, thereby reducing the peak deceleration of the cabin area. Figure 17-2. Stopping distance vs. groundspeed. The most critical and often the most inexcusable error that can be made in the planning and execution of an emergency landing, even in ideal terrain, is the loss of initiative over the airplane’s attitude and sink rate at touchdown. When the touchdown is made on flat, open terrain, an excessive nose-low pitch attitude brings the risk of “sticking” the nose in the ground. Steep bank angles just before touchdown should also be avoided, as they increase the stalling speed and the likelihood of a wingtip strike. Since the airplane’s vertical component of velocity is immediately reduced to zero upon ground contact, it must be kept well under control. A flat touchdown at a high sink rate (well in excess of 500 feet per minute (fpm)) on a hard surface can be injurious without destroying the cabin structure, especially during gear up landings in low-wing airplanes. A rigid bottom construction of these airplanes may preclude adequate cushioning by structural deformation. Similar impact conditions may cause structural collapse of the overhead structure in high-wing airplanes. On soft terrain, an excessive sink rate may cause digging in of the lower nose structure and severe forward deceleration. The only time the pilot has a very limited choice is during the low and slow portion of the takeoff. However, even under these conditions, the ability to change the impact heading only a few degrees may ensure a survivable crash. 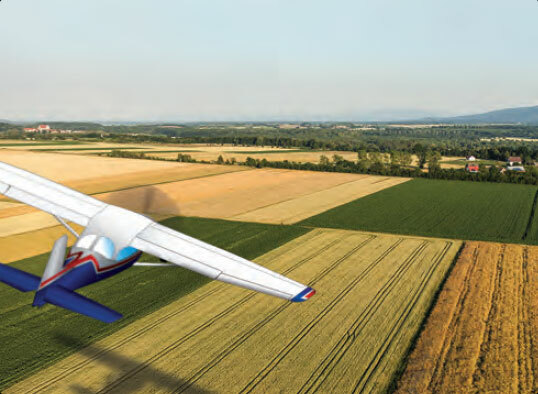 If beyond gliding distance of a suitable open area, the pilot should judge the available terrain for its energy absorbing capability. If the emergency starts at a considerable height above the ground, the pilot should be more concerned about first selecting the desired general area than a specific spot. Terrain appearances from altitude can be very misleading and considerable altitude may be lost before the best spot can be pinpointed. For this reason, the pilot should not hesitate to discard the original plan for one that is obviously better. 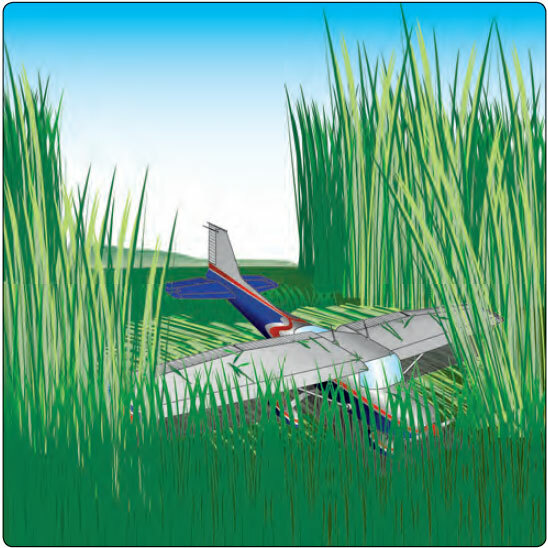 However, as a general rule, the pilot should not change his or her mind more than once; a well-executed crash landing in poor terrain can be less hazardous than an uncontrolled touchdown on an established field. Since flaps improve maneuverability at slow speed, and lower the stalling speed, their use during final approach is recommended when time and circumstances permit. However, the associated increase in drag and decrease in gliding distance call for caution in the timing and the extent of their application; premature use of flap and dissipation of altitude may jeopardize an otherwise sound plan. A hard and fast rule concerning the position of a retractable landing gear at touchdown cannot be given. In rugged terrain and trees, or during impacts at high sink rate, an extended gear would definitely have a protective effect on the cabin area. However, this advantage has to be weighed against the possible side effects of a collapsing gear, such as a ruptured fuel tank. As always, the manufacturer’s recommendations as outlined in the AFM/POH should be followed. When a normal touchdown is assured, and ample stopping distance is available, a gear-up landing on level, but soft terrain or across a plowed field may result in less airplane damage than a gear-down landing. [Figure 17-3] Deactivation of the airplane’s electrical system before touchdown reduces the likelihood of a post-crash fire. Figure 17-3. Intentional gear-up landing. However, the battery master switch should not be turned off until the pilot no longer has any need for electrical power to operate vital airplane systems. Positive airplane control during the final part of the approach has priority over all other considerations, including airplane configuration and checklist tasks. The pilot should attempt to exploit the power available from an irregularly running engine; however, it is generally better to switch the engine and fuel off just before touchdown. This not only ensures the pilot’s initiative over the situation, but a cooled-down engine reduces the fire hazard considerably. These three factors are seldom compatible. When compromises have to be made, the pilot should aim for a wind/obstacle/terrain combination that permits a final approach with some margin for error in judgment or technique. A pilot who overestimates the gliding range may be tempted to stretch the glide across obstacles in the approach path. For this reason, it is sometimes better to plan the approach over an unobstructed area, regardless of wind direction. Experience shows that a collision with obstacles at the end of a ground roll or slide is much less hazardous than striking an obstacle at flying speed before the touchdown point is reached.